The Water Main is the pipe that connects to the city's water line to bring water to your home or business. Maintenance and repair of this line is the responsibility of the property owner. Older water mains should be checked for leaks, cracks, and other damage before problems begin and water floods your property. It would seems like a buried water line would be resistant to damage, but freezing weather, tree roots, and shifting soil can damage your water main. Andrews Plumbing offers camera inspections of water mains and other plumbing throughout your home or business. Camera inspections can exactly pinpoint where damage has occurred and show you pictures of the water main damage that has occurred. Camera inspections can also indicate precisely where to dig, when necessary. These pictures help us decide if a little digging is necessary or if we need a trench the entire length of your yard. We can also assess if a compression coupler will be your best course of action, or if it's better to replace sections of the water line, or the entire water line. If you suspect that you have a water main leak, there are a few things you can check. Check your water meter, if the meter is spinning, you have a leak. Look for consistently damp areas, puddling, and condensation. Just as the Water Main is the property owner's responsibility, so goes the Sewer Line. The sewer line connects with the city's main sewer line to remove waste from your home or business. Foul smells starting in the basement is your first indicator that there is a problem with the sewer. Addressing the problem before sewage backs up into your basement will make you a happier property owner. Andrews Plumbing has extensive experience in clearing and replacing sewer lines. Your sewer line could be clogged. We can use a plumber's snake or the water jetter to clear the drain. Restaurants and other businesses that regularly work with grease or oils, are hot water jetted regularly to keep sewer lines running. Residential lines can be snaked or water jetted every year or so to keep waste moving away from your home. A camera inspection is a great aid to asses sewer line problems. It can put a property owner's mind at ease by showing clogs, instead of cracked pipes. When damage is done to the sewer pipes, a camera can pinpoint the exact location and display the exact problem or damage. 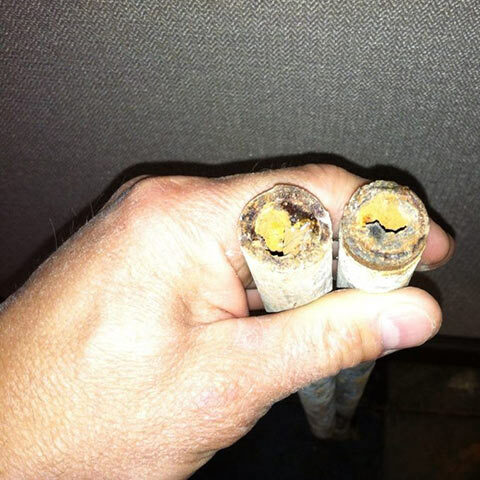 If your sewer line was constructed of clay pipe, it will crack and need to be replaced, someday. The average lifespan of clay sewer lines is 60 - 70 years. Once clay sewer lines become cracked or invaded by tree roots, it's usually less expensive to replace the entire line just once, than to replace a little here and there. Andrews Plumbing can show you pictures, explain the damage, and offer solutions to help you make informed decisions regarding your water mains and sewer lines. In addition to the large sometimes problems of water and sewer line damage, smaller problems creep up around your home or business. Leaking pipes and plumbing fixtures, improperly working sump pumps, running toilets, and other small plumbing problems can raise your water bill, electric bill, or both. The additional expense just compounds the nuisance factor of these problems.